The distinct lack of newspaper reports from 1916 is due to Australia's committment to the war in Europe. Claude West Wins Surfboard Display, North Steyne. Tuesday 7 January, page 5. The bathing season Is now in full swingIn Newcastle, and bathers say the facilities were never better. Fortunately, the conditions during the holidays have been favourable for surf bathing, and the visitors spent hours in the water daily. The only objectionable feature was the reintroduction of the surf boards, and steps will have to be taken to put a stop to the practice, which is highly dangerous, when hundred of men, women, and children, are disporting themselves in the breakers. Notices are posted on Newcastle Beach prohibiting the .use of the boards, and the beach inspectors should see that the regulation is observed. January 18, 1913, page 5. Beaming with joy over the success of her trip to Honolulu, but still glad to get back to San Francisco. Miss May Josephine Bennett, winner of The Call's girl average earner beauty contest, returned home yesterday on the steamship Sierra. Dr. Schutz and Schoen were somewhat in the lead of the others, according to admissions she made. "The duke was all right until I went surf riding with him at Waikiki beach, and then he let me fall off the outrigger. Snapshots of Miss May Josephine Bennett, winner of The Call's beauty contest, and some of the men who paid ardent court to her in Hawaii and on the trip to the islands. 3— Miss Bennett and Duke Kahanamoku, the world's champion swimmer, seated on a canoe. Sydney, Friday 7 February 1919, page 5. The members of the Freshwater Surf and Life Saving Club met with great success at the recent carnivals at Manly and Freshwater. Their performances were:— Manly carnival (25/l/19): Won march past of all clubs, surf-boat race, heat alarm reel race, and finished third in final (senior), second surf relay race, third ladies' surf race, won surf-board display. Freshwater carnival (27/l/19): Won surf-boat race, heat resuscitation competition, reel-winding contest (T. Thuring v. H. Harrington), ladies' surf race (Miss I. Farley), heat alarm reel race (M. Ryan), third in pillow fight, third in 100yds sprint (H. Harrington), and won fancy dress parade (Yankee Doodle costumes). Washinton, March 4, 1919, page 11. Seattle's dimpled chinned fight promoter, learned to ride a surf board in Honolulu in seven days, when he made a trip to the pineapple realm in 1914. Lonnie thinks it is some feat. "Surf riding sure is great stuff," testified Lonnie. "I thought my first tide was going to end in a watery grave, but it was great sport after I got the hang of it." Lonnie is also an inventor. He invented some sort of a contraption which holds a punching bag to the board but his explanation went to winds, as we are not of an inventive mind. The Bridgeport Times and Evening Farmer. Connecticut, March 26, 1919, page 13.
no need for r.-.v. iup it. Therefore we need not prcv That P.rrt 1yteH can play the ukelele. says he learned how to strum the quaint Hawaiian national instrument while visiting Honolulu a few seasons back with a theatrical organization as leading man. He also trod the beach at Waikiki, inhaled the fumes of boiling lava on Mauna Toa, and became proficient as a surf-board rider. As a member of the Metro film colony in Hollywood. Bert occasionally drags out his "uke" and rehearses his repertoire of Hawaiian melodies just to keep in practice. J-ytell, however, is not the only Hawaiian in the Metro colony. There is Jack Mower, leading man for May Allison in "The Island of Intrigue." He was born In Honolulu and can pick the steel guitar to Bert's "uke," all of which, is very diverting. New York, June 15, 1919, Section 4, page 39. Activities at the Seabright Beach Club are well under way. Not in the history of the club has the membership been so large. The diversions are centred about the pool and along the high water mark, where the club members and their guests enjoy tho sport or riding the huge billows to the high beach on home made surf boards. New York, July 20, 1919, page 11. Swimming and bathing suits and Balsa-wood surf boards patterned and painted to represent fish, illustrated at top of column. Lighter than cork and sustaining the weight of three persons in the water. Madison Avenue and 45th St.
Sydney, Thursday 31 July 1919, page 4.
ed these shores some years ago, and carried everything before him in the swimming world. The home of this sport is Honolulu, where the natives are wonderfully expert at it, and provide unlimited entertainment and amusement for the visitors from the other parts of the world. The famous 'Duke' gave his first Australian exhibition of board surf-shooting at Freshwater, Manly, during the progress of a carnival. There was rather a heavy sea rolling in from the north-east at the time, and the 'Duke' swam out with his board for about 200 yards. He waited till an extra heavy breaker came along; then he nimbly hopped on to the board and; standing erect,with arms folded, was carried with lightning rapidity shore wards. The wave landed him high and dry. Since then this form of pastime has become very popular on the beaches; but no one has ever been seen to exhibit anything even remotely resembling Kahanamoku 's brand of skill. This dusky athlete could shoot the breakers while standing on his head, or carrying another man on his shoulders, and also performed, many other tricks. (2) It is difficult to say who was the first man to shoot the breakers without aboard in Australia; but the popular belief is that the honour belongs to an Australian aboriginal, who, one day several years ago,was observed indulging in this, until then unknown, but exhilarating, pastime at Manly. New York, August 20, 1919, 2, page 12. Famous Beach at Waikiki the Rendezvous of Natives and Tourists. Imagine yourself uncertainly posed on a narrow but heavy strip of board, and tilted on the crest of a billow and leaping shoreward with all the bullet like speed which Pacific Ocean waves are capable of developing, and you have an idea then of the exhilarating sport of surf board riding, which is one of the most popular amusements every month of the year "On the Beach at Waikiki" at Honolulu. In the old days of Hawaii, when Capt.Cook of the Royal Navy discovered the islands, about the time the American Revolution was in Progress, surf board riding in Hawaiian waters was as common as automobile driving to-day. It was the sport not only of kings, but also the people, for men, women and children owned their own surf boards, marking them with their own family escutcheon and amusing themselves in the early mornings and in the late afternoons, or when the family dinner table did not require the use of nets and spears to procure fish supplies. So great became their proficiency in the art of surf board riding that this sport became a source of racing competition, and on gala days when the kings or chiefs presided vast fleets of surf board riders would swim out to the breakers and race in together, the trophies being numerous and valuable from the standpoint of the ornaments made in that day. The outrigger canoe, at first used for fishing and for communication between the Islands, which, when in pairs double decked over and used for the transportation of warrior armies, also became a source of racing amusement. To-day the outrigger canoes are few, and aside from a small number used by the Hawaiians for fishing purposes, the majority are to be found "On the Beach at Waikiki, where brown skinned paddlers entertain tourists in racing. The Beach at Waikiki has become famous for surf board and outrigger canoe riding, while it is also the place where world champion swimmers have developed, conspicuous among these being Duke Kahanamoku, the Hawaiian who still retains the title of the fastest swimmer in the world. 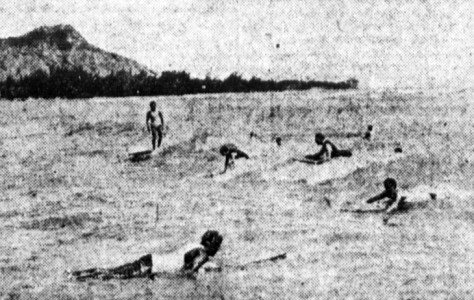 Kahanamoku and members of the Hui Nalu Club are to be seen almost any afternoon in the waters of Waikiki Beach practising and amusing themselves and developing new natorial into racing models. The splendid feature of the famous Waikiki Beach is that the daily average temperature of the water from January to December is 76 degrees, so that swimming, surf riding and, canoeing are daily amusements. At Waikiki Beach are also the fashionable hostelries of Honolulu, the rendezvous of army and navy folk, all numbering, ameers and men, nearly 30,000 ; and the crowds of tourists who now make Honolulu their summer and winter objective. cine spectacle will be presented. Natives and tourists riding surf boards at the beach of Waikiki. This is the favorite sport of the Hawaiian. On November 8 and 16 the New South Wales Surf-bathing Association, the Manly Life Saving Club, and the Manly Swimming Club will control a series of events in connection with the Victory Carnival. They will include an alarm reel race, a surfboat race, a surf-board display, and a surf race, which will be open to members of any club affiliated to the New South Wales Surf-bathing Association. It has been decided to have a netted area for the swimming races, which will contain a 60yds course. Big prizes will be given, including an order tor 6 guineas for the champion surfboat crew. Several beach and surf events will be hold in connection with the Manly Victory Venetian Carnival this afternoon. Large entries have been received from all the life-saving clubs for the surfboat race, surf board display, surf race, and alarm reel race. Nevada, November 22, 1919, page 1. Honolulu had an opportunity to see Admiral Viscount Jellicoe in action during the British naval chiefs recent visit to the islands aboard H.M.S. New Zealand. 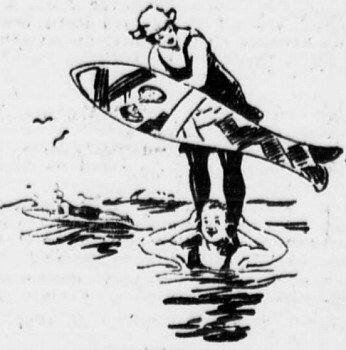 However, it was not on his own quarter deck that the wartime "ruler of the king's navee" appeared as a conqueror of the waves, but on the precarious foothold offered by a surf board at Waikiki beach. The hero of Jutland successfully negotiated the plunging South Sea surf standing up on his board. Boise, Idaho, November 23, 1919, page 13.
lt is at Waikiki beach where the tourist must stop for a refreshing dip in the brine; it matters not the month or the day- Waikiki is ever in a pleasant mood for the bather. Here it is one sees the world famous surf riders who, going far out to sea catch the incoming wave and tossing their surf board onto it they nde triumphantly to shore, sometimes standing on foot, sometimes on their heads. The board is probably twelve or more inches in width and has a length of from six to ten or more feet. Surf-riding was the national sport so long as the Hawaiians remained a nation; they are still as devoted to it as at any former time in their history. Experts among them do tricks to attempt which in pattern would be to suicide in any other person. Phoenix, December 1, 1919, page 8. Four-year-old youth ready to play the breakers with his new surf board. "Aw, gee! What'd I give to have fish like that! 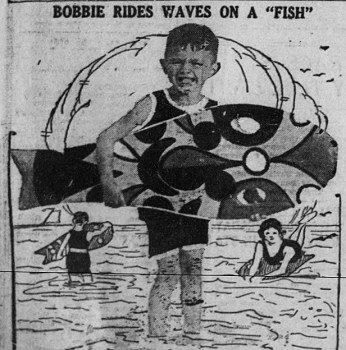 It's safe to wager that if one "sea urchin' yearned after that fashion, at least a score of his comrades did same when they saw this 4-year-old with his new surf board, playing in the breakers. tho world, called "Baka," (sic, balsa?) which is lighter than cork. It is so light that this youngster carries it to and from the beach easily. The sport performs "sea double duty, riding the breakers and at at the same time acting as a life preserver. But what really pulls the heart strings of the boys is its fishiness. Decorated after camouflage fashion, it appears as a giant fish of bright fins and scales and "goggle" eyes. Also note a later account in the East Oregonian, Pendleton, July 26, 1920, page 2. North Steyne Surfbathers Lifesaving Club held its annual carnival at Manly on Saturday. In the senior alarm reel race, Harold Hardwick and Harry Hay (beltmen) provided a close and exciting finish, Hardwick just winning. Life Line Rescue: Manly B team, 1, North Steyne and Cronulla, tie, 2. Sack Race: L. Maguire (Cronulla), 1, P. Schaffer (Bondi), 2, L. Quinn (Collaroy), 3. Senior Alarm Reel Race (teams of five): Manly A, 1, Manly B, 2. Surf Board Display: C. West (Manly); 1, S. Dowling (Manly), 2. Beach Flag Relay Race: Coogee A, 1. Wheelbarrow Race: E. Wigney and A. Hilder (North Steyne), 1, J. Dempster and O. Cunningham (Dee- why), 2. Surf Boat Race (crews of five): Freshwater A (R. Matheson, captain, H. Lassoo, D. Matheson, S. Barker, and A. Colter). Tug-of war: Collaroy 1, Manly, 2. Sydney, Sunday 7 December 1919, page 8. Yesterday was, the day of. the brown men and while hoites at the North Steyne Life Saving Club's annual surf carnival at Manly. The .principal, event was the contest for the. first of a series of races for the Cecil Heal. Memorial Surf Shield, because it records affectionate remembrance in the minds o[ all surf clubs ofouc who. was regarded. as the doyen of life-savers. The late Lieut. Healy, who was captain for several years of the Manly Club, was killed in action in France last year. The final of the Senior Alarm Keel Race provided an exciting finish between Harold Hardwick and Harry Hay, beltman of the Manly A and B teams, respectively. Hardwlck, who has just returned from active service, won alter a great race by about a yard. The performances of Manly and North Steyne were the best of the carnival. The former secured first, second, third, and fifth positions In the first heat of the Cecil Healy Memorial Surf Shield. Altogether there wore 28 starters in the event. Results:— March Past : Cronulla L.S.C., 1 ; Coogee L.S.C. and Collaroy S. and L.S.O., dead heat, i.
Cecil Healy Memorial Surf Shield point score) Competition, Itat event of the T5S-20 Competition— Surf Teams' Hacc (four reps, per club): Manlv L.S.C. (Harry JIa}-,N. O. Smith, S. O. Wrigli't, M. U. Crakanthorp), 1 ; Oronulla L.S.C., 2 ; Bondi L.S.C, 3. Wheelbarrow Race : Kirrt heat, Jforth Steyne, 1 ; second heat, Oronulla, 1 j third heat, Bondi, 1 ; fourth heat, Collaroy, ; 1 ; llfth -heat, Dcewhy, 1. Final : North Steyno (E. Wigncy, A. dlilder), 1 : Deo Why (J. l)em|iiter, C. Cunningiiain), 2. First heat, J-orth Steyne (Jielt liian,' It; iKvniis) 1. Manly B (K^ . Watson) 2; second heat; Manly A (P. W. Nicolle) 1, Colla rov (A. 'Lee)' 2; third Jitat, ilanly C (A. Mor ton) 1 (Bondi '.were disqualiUcd) : final, North fitovnc (Evans, CaililoM, Hunting, Ellison, Thom son) 1,: Manly C 2,, -Manly A 3. Idle-line Rescue (omitting. resuscitation) : Manly li (Reiu, West, Wilkins, -Dowling,. Shcad, Nitollc), 1 ; North Stcvhe. 2 ; Croniilla, 3. Sackrace o : !-. ilaguire (Cronulla). 1 ; P. Shaffer, f Bondi), 2 ; L. Quinn (Collaroy),: 8. Flag Beach Relay Race : First Heat, Coogee A, I ; Drowhy A, 2 ; Dccnhy B, 3. Final. Coogce, 1; Dcewhy A, 2. Surf Boat 1 Race : Freshwater A, 1. Surf board Display : C. West (Manly), 1 ; S. Dowling (Manly), 2. Cen tipede Race : Final North Bondi, 1 j Deewby, ?1. Surf Raco (numbers afDliatcd clirba) : K. O. WatMii (Manly), ' 1 i H. B. Brown (North Stovnc), 'J. Senior Alarm Reel Race : First hciit, Manlv \, I ; second heat, Manly B, 2 ; final, Manly A (beltman, Harold Hardwick), I ; Manly B (Harry Hay), 2.' Tug-o'-War : Collaroy, 1: Manly.''-:.''. ? Sydney, 21 December 1919, page 23. Rockhampton, Queensland, Saturday 3 January 1920, page 36. Sydney, Sunday 28 December 1919, page 11. Among the dozen or so Sydney girls who have become expert in the use of the surf-board one of the most skilful and graceful is Miss Helen Andrews, of Roscoe-street, Bondi, and her dexterity is all the more remarkable from the fact that, unlike the others, she had no opportunity of studying the methods of the Hawaiian' swimmer Kahanamoku, who was the first to introduce the board seriously into this country. When Kahanomoku visited Sydney Miss Andrews had never seen the surf. She is a native of Adelaide, and came to Sydney only two years ago. The trip was a holiday one, but her parents decided to make Sydney their home, taking up their residence in Bondi, Miss Andrews was always fond of the water. She was one of the best swimmers in South Australia, and competed in tho women's championships In that State, though so far she has neglected speed work for surfing since her arrival in Sydney. The surf appealed to her as soon as she went to Bondi, and she showed a remarkable aptitude for mastering its vagaries. While it takes the average young athletic man two or three seasons to become a surf-shooter, Miss Andrews was able to match it with the best of the men before she had got well into her first summer. 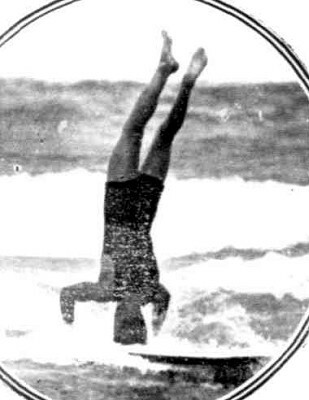 Miss Helen Andrews, of Bondi, on the surf board. photograph of her carrying her board on the beach. In a few weeks, she was able to use the board as well as any woman on the beach. To-day she can do nearly everything the best of the male surfers can do, and with almost equal certainty. She possesses remarkable judgment in timing a wave, knows precisely whether it will carry the board or not, and once started can sweep in sitting, kneeling, standing, or lying down. Her star turn consists of getting a good start crouched and then standing on her head! During the war Miss Andrews devoted much of her time to war work. She was originally connected with the Australian-American War Workers' Cafe, and at present is assisting the Voluntary Workers' Cafe in Pitt-street. He is the proud possessor of a board of his own, and is probably the smartest youngster of his age in Australia in its manipulation. Geoff Cater (1997-2019) : Newspapers, 1919.